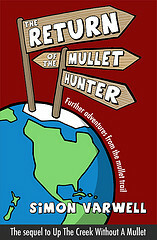 The Return of the Mullet Hunter continues to sell slowly but steadily, and I’m grateful to everyone who’s bought a copy. This is the second of five free days, as well, and quite a few copies are shifting through that too. It’s all been aided by a few bits of media attention that the book has got. Firstly, there was a brief mention (see left) on Saturday 11 January in the Brisbane Courier Mail of the book in a big feature they were doing about travel writing. Despite them missing the last word off the book title, I’ve a bit of a soft spot for the Courier Mail. 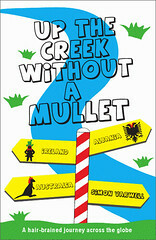 This is mainly because I had such a fun chat about my mullet hunting with journalist Rod Chester towards the end of my Australian adventures in 2005 (as retold in the final chapter of Up The Creek Without a Mullet). Rod and I have kept in touch over the years via Twitter and Flickr, which is nice. I enjoyed our interview, though it was a struggle to dig up anecdotes and perspectives on adventures that happened as far back as 2003. It’s scary to think that the mullet mission is that old. 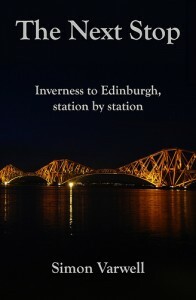 We did also chat about The Next Stop, which was much fresher in my mind and therefore easier to talk about. The mullet chat with the Inverness Courier helped, however, to hone my skills for this morning: a live interview with BBC Radio Suffolk. Those who’ve read The Return of the Mullet Hunter will recall the help that BBC Radio Suffolk gave me back in 2006 when I hunted down the two Mullett’s Farms in the county. I was interviewed at the time by Mark Murphy, who back then presented the station’s breakfast show. These days he’s on the mid-morning show, but I nevertheless dropped him a line the other day to tell him that my mullet adventures – and indeed him and his show – has been immortalised in my new book. Mark got me back on the show to talk about my book, the mullet mission and his show’s involvement, all as part of a piece about quirky “collection”-based travel ideas. It was lovely to talk to Mark again, even though he did ask if I was okay mentally for pursuing the mission (something I’ve often wondered myself). Despite that, hopefully I gave a good account of myself – and for the next seven days you can listen for yourself. Just click here and jump forward to two hours, ten minutes. I’m not aware of any other coverage of The Return of the Mullet Hunter, though the slowly increasing number of positive reviews on Amazon are all very, very welcome indeed. Once again, thanks to all who’ve bought the book. And extra thanks to those who’ve actually enjoyed it.